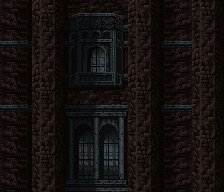 It seems true what the short description on the main page states: This Castlevania place never looks the same. "Why is that?" someone with a suspension of disbelief might ask his or herself. There are two opposing explanations--from both an external and in-game view--that I will use to make at least a modicum of sense: Externally, obviously, the castle has to be different or else Konami would simply be creating the exact same game again and again. But to give those changes made from game to game some semblance, there's the "Creature of Chaos" theory supplied by Alucard in Symphony that states that the castle may take many incarnations. Based on the preceding, I'll look at these many instances of change to see that the more things do change in this crazy Castlevania world, the more they're actually staying the same. This Castleography section is broken up into four areas: (1) Starting from here, a three-page castle overview--I'll look at each area of the castle and draw comparisons from one game to another; the second and third such pages will look at each game individually and show how/if that game followed those same blueprints. (2) A two-page look at the recurring halls of Castlevania ("Castle Halls" and "More Halls"), which includes whole stage maps. (3) A look at the famous castle keep and its makeup direct from the games in which it has appeared. (4) Isolated instances of all-too-similar structure from two or more games. Above is the between-stage map that you could ordinarily see in the original Castlevania. I've always felt that this map has and always will represent the true form of the castle--all two halves worth. With that in mind, I've manipulated the image with letters, each representing different areas of the castle that we, as gamers, have traveled through in any of the twenty-plus series' titles. To wit: Try not to see the castle as a flat entity that only goes straight both ways; it has outer dimensions that are ignored. In such instances, an individual letter may very well represent two separate areas--one in front plus another other behind it and vice versa. Starting from "A," I'll go all around and give a synopsis of each area and its recurring traits. (A) The Main Hall: This is, perhaps, the most defining area of the castle, having appeared in a large number of games (and in Konami's Castlevania-related series). Its typical form is two halls featuring pillars and worn-out-curtained windows; sandwiched in between is an alcove split by an unpassable wall with a fishman-inhabited water trap below it as the only means to get around. There are few instances where it deviates from this design, wherein it's altogether similar (Castlevania III: Dracula's Curse) or just ignored completely (the first two Game Boy titles). Click on "Castle Halls" and "More Halls" at the bottom for more on this phenomenon. (B) Alchemy Lab: This is the fairly huge lab where whomever or whatever dabbles in science to create all kinds of devious contraptions. Early in the series, if you can't draw the association, this usually entailed piston-like spike beds and moving platforms. (C) The Castle Ruins: This name is misleading because this area of the castle serves a couple of purposes. The ruins are actually a baron area of the castle that would ordinarily serve as a lookout or bell tower. These towers have shown to lead into the following area. (D) The Chapel: Evil beings need a place of worship, too, and Dracula's castle provides them a place to do so. The chapel, always adorned by the stained glass windows, is usually home to long interconnecting regular and vertical chambers, separate bell towers and other religious artifacts. (E) The Abyss: It seems as though once you've reached the top of the castle, the only way to continue further is to drop down this long pit. This is due to the castle being separated into two sections by the courtyard, which you may have experienced in full while playing Castlevania 64. (F) Underground Areas: These can be anything from underground waterways, underground caverns, catacombs or abandoned mines. In most instances, it's from these basement-type areas that the heroes have sneaked into the castle to avoid coming in from the main hall. Other times, it's where you'll end up for traveling near part E of the castle. (G) The Outside Ruins: These grounds could be seen early in the series--after emerging from the underground--as an incomplete area of the castle. As it grew, it became grounds for the Villa and its hedge maze after being inherited by Olrox, a fellow master vampire. A common reoccurrence here is a nesting ground for eagles who like to carry and drop hunchbacks. Otherwise, it typically leads into the castle's latter half via a final cavern (which is sometimes covered in ice) that serves as a direct basement to the dungeon. (H) The Dungeon: No evil castle is complete without one. Only the lower portion of this area seems to be the actual dungeon, however--therein, it's more or less another type of laboratory, as you'll find when you reach its upper levels. It'd be best to describe point H as a dungeon/torture lab, where Dracula sends hapless victims to be impaled, embalmed, skinned and mummified. Oh--and his closest ally, the Grim Reaper, likes to hang out around here, too. (I) The Storage Facilities: Dracula's army is sure to plunder, and he needs somewhere to store all of these riches and artifacts--this is certainly the place. When comparing the maps from each game, we find that this could be anything from a treasury, to a hall of mirrors, to a water supply of some type. (J) The Upper Bridge: This is just one long bridge, and it's usually crowded by all different bat types. The bridge itself is a connector of the uppermost right towers and the clock tower (and sometimes the castle keep itself). It's perennially prone to collapse as you walk upon it, too. (K) The Clock Tower: It's almost a given that you will in each game trek upward through a clock tower. In essence, you'll go through room after room of gears, pendulums, spokes, spinning cylinders, moving platforms and any other number of dangerous contraptions while fending off Medusa Heads and while circumventing spike traps. If you make it out alive, you'll find yourself (usually) at the castle's heights. (L) The Castle Keep: While its design seems architecturally impossible, this doesn't prevent the keep from remaining Dracula's favorite place to relax while sipping on some warm blood. The keep encompasses a stairway that leads upward through a short hall and into a throne room. It's at this, the highest point of the castle, that many of the Belmont-Dracula battles have occurred. Click on "Castle Keep" at the bottom of this page for more information. (M) The Ceremonial Room: When it's time to resurrect Dracula from his unearthly realm, the forces of darkness usually gather here to hold the respective rituals, be it through sacrificing, chanting or unwavering homage. Dracula can also use these closed quarters as a second throne room away from the keep. (N) Castle Entrance: In the more straightforward titles, this is where your adventure begins moments before you make your way into the castle. This long entranceway, itself, is meant to be a bridge that connects the woodland (the Forest of Silence, as it became known) to the castle's guarded (or sometimes ungaurded) entry point. (O) Long Library: Evil needs to read, too? I doubt it--but the castle has its own huge library for the sake of cosmetics. Therein, this is one of the least-traveled areas of the castle. Most famously, it's home to the Master Librarian, who resides over the library and keeps it organized. There's always a catch: It's haunted, too, so you'd better believe that its books will come alive and then shake, rattle, and generally obtrude your path. (P) The Armory: This is a sometimes-present sub-entrance into the castle keep. Depending on the castle's structure at the time, this connector area is home to knights who act as a last line of defense (such as the axe knights below the keep in Symphony or the ones guarding the path in Adventure). (Q) Mountain Range: Think of this boundary as a back entrance into the castle. This path through the mountains, through more woods, and over the docking bay leads into the basement (again, into any of the underground areas). And as its name suggests, the ominous mountains that surround and guard the sea will be the primary visual. (R) The Castle Center: This front-most area of the castle is a road not often traveled. There's hardly a theme to its presence other than to act as the castle's active center point and to provide several shortcuts into its rightmost towers. The heart of this area is simply a collection of stone halls whose job it is to connect together several areas of the castle, including the library and the colosseum. (S) The Towers: There are quite a few towers, many uncharted, lining the upper regions of the castle, and their entry points are many. These can be the aforementioned lookout and bell towers or, more likely, the recurring towers found throughout the series: The Observation Tower, the Duel Tower, the Tower of Art, the Tower of Sorcery, etc. For the sake of consistency, we can say that towers have a semblance of themes, like the storage facilities that can take the place of treasuries; that is, while the appearance may be different, the tower's job is the altogether the same. (T) The Garden: This first courtyard-connected area can be found outside of the main halls' end (as seen in Rondo when you exit to face Lypuston). This rarely-traveled path leads through a short woodland and into the courtyard itself. (U) The Courtyard: This is more or less the whole outside area between the two halves of the castle, and it leads directly into the castle center. The courtyard is home to all types of decor and miscellaneous cave entries, and it houses the castle's very own graveyard. From the courtyard, you can easily reach the outside ruins (G), too. (V) The Outer Wall: The outer wall isn't an area per se, as it actually spreads through the whole back of the castle's right side. However, the V represents its starting point, where it hooks around and connects to the rightmost castle wall. The outer wall reaches high up and can encompass several areas in the castle's latter half; as such, it's possible to see the name "Outer Wall" branded unto areas where the wall only serves as the overlying visual (as you'll see in Circle of the Moon). (W) The Inner Den: This neglected castle area, with its myriad of moving platforms, is used as means for transporting into the castle's upper regions (mainly its towers) the materials manufactured elsewhere. More urgently, the forces that lurk here serve as the main defense for the castle's latter half when infiltrators come in through any of the underground areas or the mountain range. (X) The Gallery: This is sort of a museum in honor of the Tepes family, as you'll see many pictures, statues, sculptures, tapestries and any other artifacts that have been collected over the eons. Everything here is well-designed, too, and mostly carved from marble. The gallery is prone to stretch around and behind other existing areas in proximity and thus covers an increasingly long horizontal distance. (Y) The Warehouse: Below the main halls and just above the catacombs is another storage facility. Its positioning is logical because it's easy to from here transport goods to the entrance and into and out of the castle. In the warehouse, you'll find boxed goods, books, damaged artwork, artillery and anything else for which Dracula couldn't find another place. (Z) The Colosseum: Violence isn't exactly something to which Dracula is a stranger, and even an immortal Dark Lord needs some entertainment to boot. When he's in need of a good time, he'll come here and pit some of his soldiers against castle intruders, against each other or perhaps against a giant demon bull. The colosseum is also the perfect place to (a) store his weapon collections and to (b) send his weapon-using minions to train further.